2007 Reunion: Seattle! Saturday and Sunday, August 11 and 12. The Mayflower Hotel is right in the core of downtown Seattle. Built in 1927, it has been recently restored and retains the ambiance of a classic European hotel. All of the fine shopping stores are within a couple of blocks. The monorail is on the other side of Westlake Center with access from the mezzanine level of the hotel. 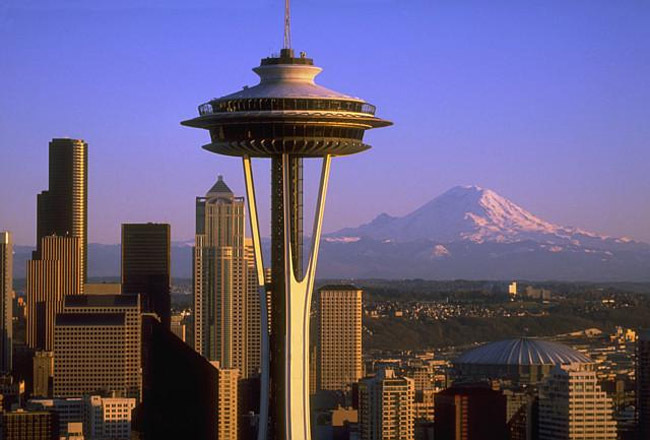 This will whisk you to Seattle Center where you find the Space Needle, the Science Center, the Experience Music Project (history of rock and roll in building designed by Frank Gehry), and other attractions. From the hotel it is a matter of a few blocks on foot to the Pike Place Market where farmers bring their produce and the fish is always fresh - a big Seattle destination. The hotel has one of the best restaurants in the city, but should you wish to have breakfast or lunch elsewhere, there are many other choices nearby. Scheduled events would include a city bus tour on Saturday. It would probably take in the two new stadiums for baseball and football, the International District, the University of Washington, Fishermans Wharf, the Ballard Locks, Seattle Center, Pike Place Market, the waterfront, and perhaps a residential area. A Saturday evening group dinner will be in the hotel. Sunday we will take a short boat ride to Tillicum Village on Blake Island where local Indians will treat us to their cultural traditions plus a salmon bake feast with steamed clams, a salad bar and chocolate dessert. We will be free to roam the beach and enjoy a spectacular view of the city and Mt. Rainier - altogether, a 4-hour excursion. In addition to Seattle's many attractions and gourmet coffee on nearly every corner, this can be the base for a great vacation: Olympic Peninsula with its mountains and rain forests, San Juan Islands, North Cascades and Mt. Rainier National Parks, Mt. St. Helens, Pacific Ocean beaches, Vancouver and Victoria in Canada. Members may access more detailed information on reunions at www.wmdawes.org/genealogy/reunions.php. 2005 - July 8, 9, and 10 in the Black Hills, South Dakota. Organized by Ellen Wilhelm. Attractions: Mount Rushmore, Crazy Horse Mountain, Custer State Park. 2003 - June 21 and 22 in Boston, Massachusetts. Organized by Margaret Hyun. Attractions: Freedom Trail from King's Chapel to the Old North Church, Dawes route of the Midnight Ride bus tour. 2001 - April 20, 21, and 22 in Tubac, Arizona. Organized by Hattie Dawes Wilson. 1999 - June 26 and 27 in Newark, Ohio, and June 28 in Marietta, Ohio. Organized by Bertie Wood & Mary Jane Bolon. Attractions: Dawes Arboretum, Daweswood House tour, Granville Presbyterian Church and historic district, National Heisey Glass Museum, and numerous Dawes historic sites. 1997 - August 16 and 17 in Torrance, California. Organized by Bertie & Wistar Wood. Attractions: Redondo Harbor boat tour, South Coast Botanical Garden. 1995 - in Templeton, California. Organized by Duane & Janice Dawes and Ferne & Bud Wilson.